We're having a difference of opinion in the Baudelaire household. And it's pretty important, so I'd like my faithful readers to weigh in. Three scoops is the minimum recommended serving size. ﻿The first thing you should know about this raging debate is that we're talking specifically about Blue Bell Cookies 'n Cream. Blue Bell is hands-down the best grocery-store ice cream there is. If you live in one of the 20 states where it's sold, you know this. If you don't...plan a trip. Blue Bell is made in Brenham, Texas, northwest of Houston. It's full of cows...Brenham, that is, not Blue Bell. Blue Bell is full of cow milk. For years it's been said that the reason Blue Bell ice cream tastes so good is that the cows think Brenham is heaven. The company's advertising is full of corny homespun humor like that. But it doesn't affect the flavor of the ice cream, which is awesome. 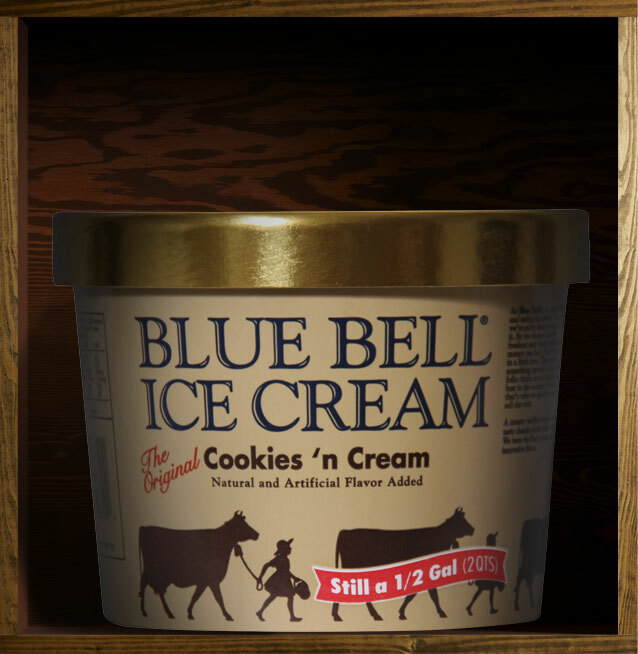 Blue Bell first popularized cookies and cream as an ice cream flavor in the early 1980s. There's some debate as to who actually invented vanilla ice cream with Oreos (or similar chocolate sandwich cookies) crumbled up in it. But there's no doubt (in my mind) that Blue Bell does it best. you live in a land of ice cream barbarism. I weep for you. 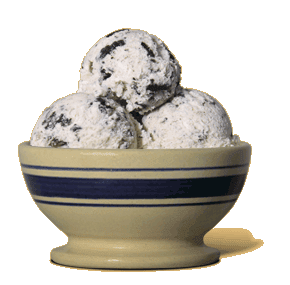 So here's the hotly debated question that came up over the weekend: Is it poor quality control or awesome good fortune to find a whole or nearly whole cookie in your bowl of Cookies 'n Cream ice cream? There is a very specific reason the current household debate centers around Blue Bell Cookies 'n Cream. Quite simply, you're not going to find an intact sandwich cookie in any other brand. (Here's what it looks like, as captured on someone's Flickr page.) In other brands, you're lucky to find fingernail-size chunks. Mostly you get crumbs or fragments. With some of the cheaper brands, you get vanilla ice cream that seems to be plagued with black speckles, so pulverized are the "cookies" within. They go farther when you grind 'em up small, and it's cheaper that way. But Blue Bell has a magical ratio of small bits of cookie that pleasantly flavor the ice cream to large pieces that you actually have to chew and swallow separately. 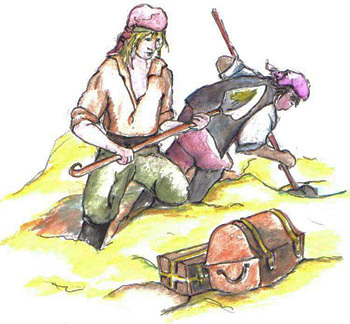 Digging the scoop into a carton of Blue Bell Cookies 'n Cream and coming up against a solid chunk of cookie is akin to what treasure hunters must have felt when their shovel finally fetched up against a pirate's chest after a long day of digging. Yar, there be Moose Tracks here! ﻿Beloved Spouse had the good fortune to turn up a significant portion of a cookie as he helped himself to the last bowl of ice cream. Only he didn't see it that way. He took the position that it was a failure of quality control that would allow such an unwieldy hunk of creme-filled cookie to make it through the production line. Precocious Daughter and I disagreed vehemently. 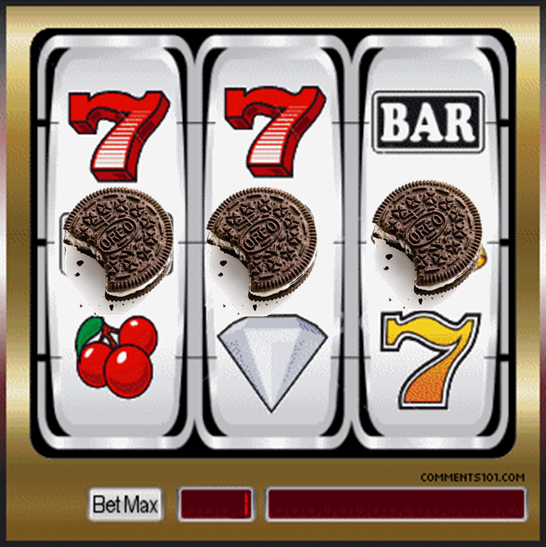 Finding big cookie in your Cookies 'n Cream is like matching the third number on your lottery scratch-off ticket: It's payday. I think my exact reaction would be, "Hey, free cookie!" Although, I'm not a big Cookies and Cream fan. I wouldn't kick it out of bed, but honestly, I'm a coffee ice cream girl. Bruster's used to do a coffee/Oreo that was excellent.